How you format your blog posts is important. You want your readers to be able to easily scan your posts and digest the information you’re presenting. Stay away from long, overwhelming chunks of text and leverage elements like headings, bolding and other formatting elements, lists and bullet points. That kind of thing. As reader friendly as possible is the name of the game. Images on blog posts have been long considered a best practice of formatting blog posts. Some people use them, some don’t. They do help to catch interest and break up the content. They are also a part of social media content, showing up on channels like Facebook, Google Plus and Linked in when sharing links. 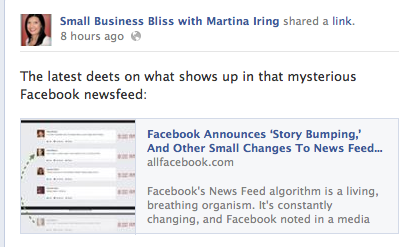 Now, images in posts have a new dimension of importance with the recent shift on Facebook. Facebook always showed a blog image when posting a link. But they’ve changed things up to make the image more crucial that ever before. As you can see, the image is much bigger. Images on Facebook are reported to get more engagement than any other type of content. (Not in terms of reach though, that still goes to text only Facebook posts). They definitely capture that attention you want! So something that a lot of us were doing was to upload the image to the post and then including the link in the text to make the image front and center. This new shift makes this tactic less necessary, especially considering that when the new larger image is clicked on, it takes you to the post, rather than to just the image view on Facebook. So if you haven’t been using images on your blog, it might be time to start. Dimensions for the new Facebook link posts are 1200 pixels x 627 pixels, with the minimum being 560 x 292. If you don’t do anything special, Facebook will automatically render the image. For many images, this will work no problem. I was doing a bit of experimenting and I noticed that some of my previous post images looked just fine without me having to worry about posting an image of any certain size. However, if your image includes text or is something like a screenshot for example where it’s important how it shows up for readability, you should consider customizing the dimensions when posting the image to your blog. *Note: if you’re using teensy-tiny, low pixel images or screenshots, then your post image will show up the old way. This affects the images that show up in ads too and definitely if you’re spending money running an ad, you want to be conscious about the image sizes so that you ad looks its very best. That the new picture display doesn’t show in the little preview window as you’re posting, but it will show properly when it’s up on your page or in your activity log if you’ve scheduled the post. So, with all this talk about the importance of images, what kind of images can you use on your blog? Take your own photos of your business in action. Your employees, your location, stuff happening at your biz, events you’re attending. You can also take photos around town, things that inspire you. Then use them in your posts as appropriate. Images that your designer has created for you or that you own, such as product shots or branded graphics. Use free images available online. Remember, just because an image is online without a watermark, such as on Google images, doesn’t mean it’s free to use. Use sites that clearly state image use – you’re often required to link to the post. (if you’re thinking this isn’t important zip on over to this post to learn about what could happen if you use an image without permission. It also includes some options for finding these free images). Create your own graphics if you’re savvy at that. How do you come up with images for your blog? Have any tips and tricks up your sleeve? Share your insight and experience in the comments below. 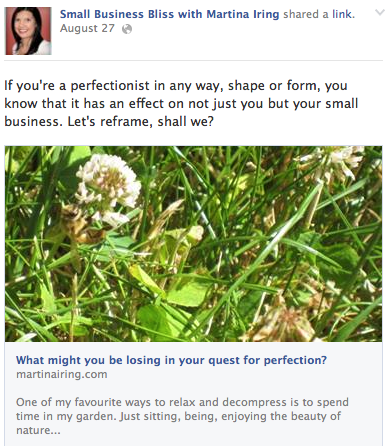 oh wow, I hadn’t even noticed the change, Martina. It looks great! And totally agree that images are key ! I’d add to that to also pay attention to your blog headings. Add some color to those as well, it really breaks up the text and makes it easier for the eye. Sarah recently posted..Are You Overdosing on Webinars? Previous post: Running Facebook promos – now without the need for 3rd party apps!